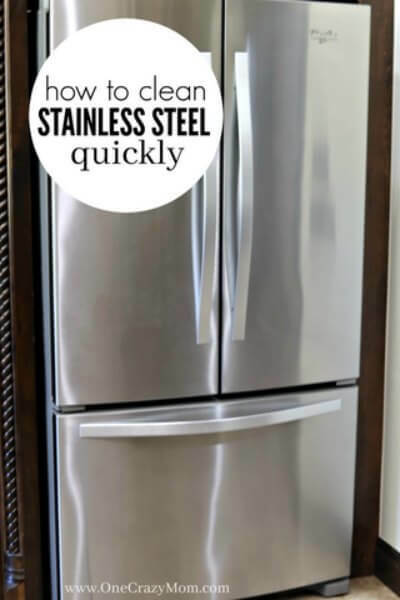 Learn how to clean stainless steel appliances with only 2 items! 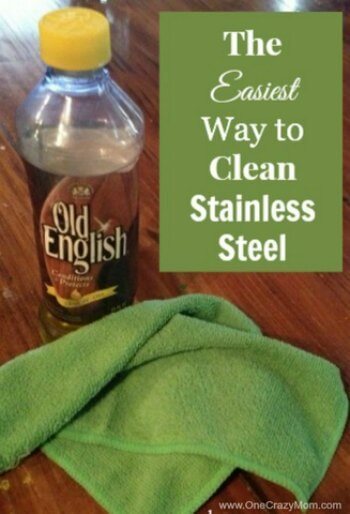 Cleaning stainless steel is easy when you know the trick! When we built our house we decided to get stainless steel. With 4 children, we thought our life would be easier since stainless would be so easy to keep clean. Boy, were we wrong. Stainless looks beautiful, but only when it is perfectly shiny. However, cleaning stainless steel is pretty much impossible. No matter what you do you will be left with streaky, splotchy, and ugly stainless steel. You will not have that beautiful shiny stuff that you fell in love with when you decided to spend the extra money on those beautiful appliances. However, we have just trick to make your stainless steel appliances shiny and new again! You will feel like you went and bought new appliances. You only need 2 items to keep your stainless steel looking new: a microfiber cloth and Old English. Yes, that is really all that you need. I told you it was easy! I bought my microfiber cloth at Dollar Tree for just $1, but you can also purchase them on Amazon for a great price too. You can find Old English almost anywhere including Walmart, Target, and even on Amazon. If your appliances are really messy with crusty stuff on it, then scrub them off first with water. Dry completely. Just do not use anything abrasive or you will scratch your stainless steel appliances. We do not want that! 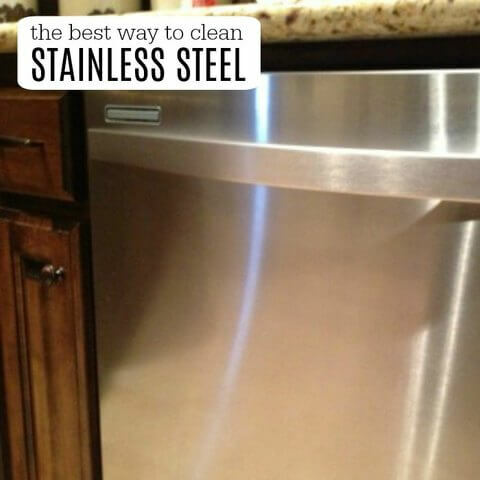 Then you can clean your stainless steel. Pour a small amount of old English on your microfiber cloth. Then start rubbing the old English on the stainless in circular motions. Do this completely over the entire surface. You don’t want the Old English to drip. If it is doing that, then you are applying too much. You will not need much cleaner at all. No worries if you get too much, just wipe off excess with paper towels or a clean cloth. Just do not use anything abrasive like steel wool. You don’t want to use anything that will scratch the stainless steel. Cleaning Stainless Steel really is that simple! Look how gorgeous the dishwasher looks! There isn’t a single smudge or finger print. In a matter of a few minutes your stainless will look amazing! The Old English is actually really good for the stainless steel. 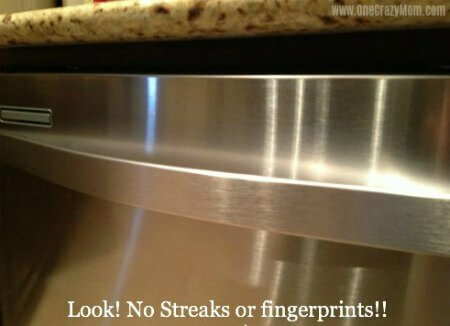 Not only does it safely clean your stainless steel, but it also helps prevent more fingerprints and streaking. Woohoo! Can you believe it? It looks wonderful and helps to prevent finger prints and more from coming back quickly. That is a winner for sure! And it is budget friendly. Yeah! 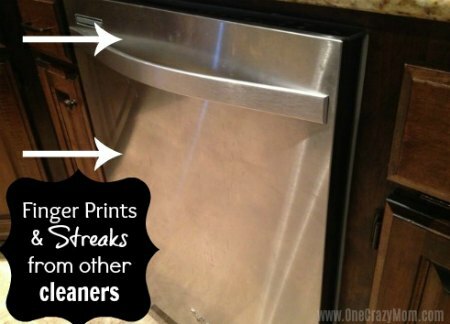 Now that I know how to clean stainless steel refrigerator and other appliances, it’s so easy! It takes me less than 10 minutes to clean all of our appliances, so there really are no excuses. How to clean stainless steel sink? Try using baking soda to to clean your stainless sink. Baking soda cleans the sink gently without scratching the stainless steel. Make sure you Follow me on Pinterest for more diy and money saving tips. 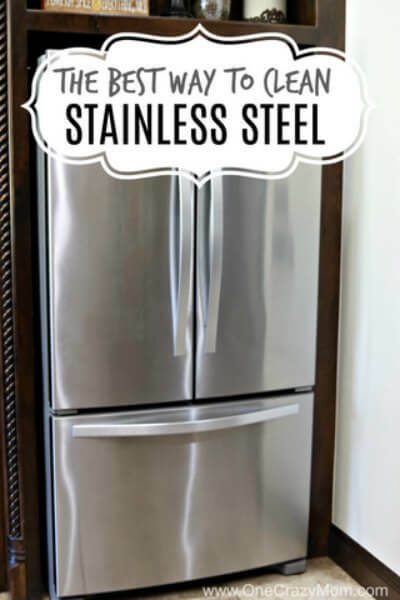 How to clean stainless steel appliances with baking soda? Use baking soda and water on a sponge to clean stainless steel appliances. Wipe clean. 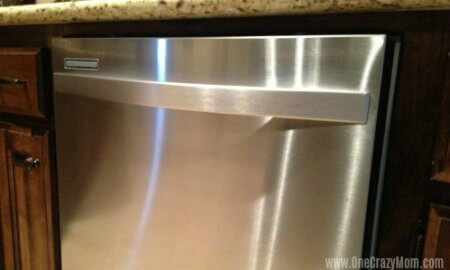 How do you get fingerprints off stainless steel appliances? Use one of the methods we mentioned. Either Old English or baking soda will clean stainless steel and remove finger prints. What is the best thing to use to clean stainless steel appliances? There are several options but my preferred method is to use Old English. It leaves the appliances so shiny they look brand new. Plus, the polish seems to detract dust and fingerprints keeping the stainless appliances looking cleaner longer. It’s nice getting a little break and not having to do it so frequently. It seems to also prevent water spots on the stainless steel surface. Just make sure to use a soft cloth to clean your stainless. I definitely think this works best. Give it a try and see what you think! It’s a great cleaning tip and can replace many costly cleaning products for cleaning stainless steel appliances. Your kitchen appliances will be shiny and new. No need to buy fancy or expensive stainless steel cleaner when this work so well to remove stains. It is a cleaner and polish in one. Some people have tried cleaning first with dish soap and wiping down with olive oil but I find this very messy and does not always do the best job. Old English just works the best for me and I love the results. Learn how to keep your house clean with just one daily task. Since incorporating these tips into our daily routine, our weeks are so much smoother. No more spending entire Saturday’s cleaning. It truly has changed everything for us. Get the entire family involved and it will be a breeze. My only regret is not implementing these tips into our lives sooner. Once we started doing this, I felt the stress lifted. I always hated spending my one free day of the week cleaning. No one wants to do that. Now I get it all done with just a simple task each day. Give it a try and let us know how it works for you. I think you will love it! Learn How to Make a Pillow Cover. It is very simple and so budget friendly. Do you ever worry about the chemicals in the daily products you use? Learn how to make bleach alternative so you can wash your whites and towels without bleach. Learn how to soften towels quickly and easily. How to soften towels without fabric softener and freshen your towels. Learn how to clean blinds quickly and easily with these easy tips. How to Clean Stove Top with one easy step! 5 Best Cleaning supplies you need! What type of Old English Oil do you use? I had a couple on hand and tried those. One was a spray and it worked okay. Then I had a scratch repair and tried that. It eliminated more of the smudges and light oily looking areas, but I had to basically buff it off since it has brown stain color. Loved this idea and it looks great! Just wondering if I need to buy a different oil to effectively clean my appliances though. Thanks! I used regular Old English and a microfiber cloth.